I have it on good authority (University of Texas) that Girolamo Cardan documented DeLudo Aleae (along with Ars Magna); even though DeLudo Aleae was published posthumously (sometime after 1576). Others added directly to, or along side of, Cardan’s work on these games of chance; such as Galileo, Descartes, Huygens, Newton and Leibnitz. And of course there also was John Graunt of London who (it is my opinion) thought that the greatest game of chance was death; therefore his London Life Table which shows the chances of reaching a specific age. Among these scholarly people such profound works as the following are found. “Kybeia, quoe combinatoriae genus est, de Alea, et Ludis Fortunae serio desputans” (Carmel). But nothing is shown to us of the work of Tripsek Gunf. Tripsek Gunf was not only a great thinker but also a practitioner of what he had contemplated. This is, more often than not, a dangerous combination. It is one thing to ‘think.’ It is one thing to ‘do.’ But to think and do can lead to dire outcomes as Gunf (not so soon) realized. The story that I now relate is founded on the holdings of another university; The University of Romaniciate, Galicia. The document that I describe below is old and, at times, undecipherable. However, what is readable has been verified by several scholars in Galicia. Gunf [1243- 1305], Tarnapol (now the Ukraine) had completed work on several aspects of gaming. Most of this work was completed for the purpose of betting on horse races across the steppes. One of the largest problems that Gunf encountered was the random way in which the horses were lined up at the beginning of the race. He had noted, over the years, that when certain types (colors, leg length, etc.) were more toward the north side of the starting line, they were more likely to win. Gunf spent winter after winter attempting to understand this anomaly. The problem was too large for him to keep organized in his mind. One winter, he made thirty clay models of horses of different types and colors. These he arranged and re-arranged according to his almost flawless memory of past races. He soon realized that the odds approached infinity as the number of horses in any one race increased. Starting out with two horses and then working up to three, then four, then five, six, and so on, his problem could be clearly seen. The total number of combinations became mind boggling. His problem was now a new one (as life’s problems are always new). Gunf had to determine a method that he could use to quickly determine the possibility of all combinations. And, he had to do it as the horses were lining up at the starting point so that he could place his bets. Gunf was able to prove to himself that it was a problem of multiplication. In a one horse race that horse would always win. Two horses could be lined up in two ways so either could win. However, once there were three horses they could be lined up in any of six ways therefore he had to make six considerations before betting. 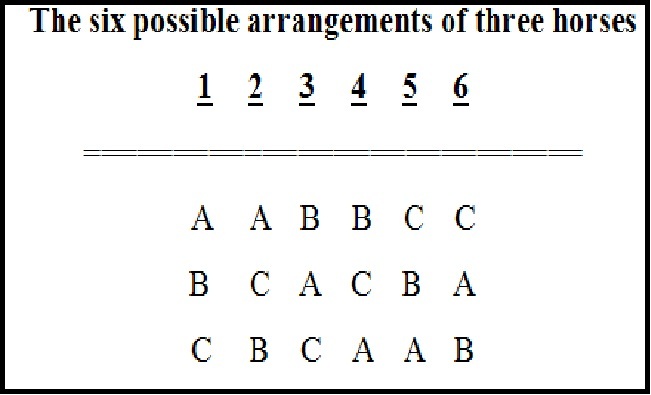 As you can clearly see there are six possible ways that “A”, “B” and “C” can win, place or show. Gunf’s only problem was a philosophical one. The numbering system that prevailed at that time started with zero. This was necessary for the accounting of multiple bushels of wheat. Gunf decided that this zero (0) problem could be rectified with an analogy. The analogy was a comparison to the possibility of the race being cancelled. He set this factor to the value of zero (0). 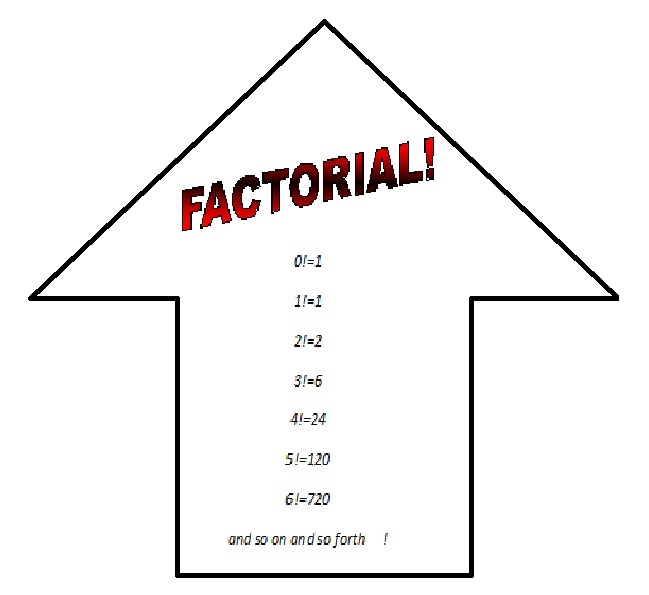 He could now quickly perform all the mathematical operations on the “factor tables” that he had created. The mathematics worked out fine if he set the factor “0” as equal, numerically, to “1”. He knew that this was troubling but also realized that he would never be expected to bet on a cancelled race. Therefore he did not dwell on it. “Gunf’s Tables” of combinations and permutations where invented. He became the richest man to bet on equine races in Tarnapol. The astonishing history of Gunf hardly ends at this point though. The energy of his mind overcame the possibility of the effete life normally brought on by riches. Gunf now had money and access to travel. He visited some of the most famous libraries in the east and west. He read anything that he was able to (and had others translate and read for him what he could not). During that time Gunf had his tables drawn up by scribes that were often available in the libraries of large cities. It was during this period that one of these scribes suggested shorthand for these factors that he used. They agreed upon the sign ! as the shorthand for these factors. 1! would represent a one horse race (and the only combination possible). This, mathematically, would be written in long hand as 1. The two horse race would be 2!, which, of course, would represent the long hand mathematics of 1 x 2 = 2 (or two combinations in which the horses could finish). Then, logically, 3! (if calculated longhand) would be 1 x 2 x 3 = 6 different ways in which the horses could finish; 4! as 1x2x3x4=24 different ways to win (and so on and so forth). This allowed Gunf to determine his odds with great speed. He became very wealthy. Now Gunf was not only rich, he had fame also. The “Gunf Tables” were copied and placed in one of the most famous libraries of the world. Still, even with the riches, even with the fame, something was bothering Gunf. Something was not quite right with the tables. Deep down, as deep down inside every man, something bothered . And he unconsciously knew what it was; although he could not admit his mind to dwell on it. Gunf read philosophical treatises, religious tracts, various bibles, the Quran, Greek tragedy, and, had others read to him from their favorite books and passages. (He knew what he was seeking but could not voice it.) Finally, after enough encounters with it, he dreamt of it. On that fateful night he saw the number “1” over the foot of his bed. The figure of some foreign god held the number chest high until he saw Gunf’s eyes open. The foreign manuscript that this story is written on has deteriorated. Therefore I can not honestly say that I know whether Gunf saw this god with his open eyes or the god saw Gunf with his eyes open. It really does not matter because the crux of the dream is that Gunf saw the number “1” being held aloft by this figure that he interpreted as a god. Around his bed stood the scholars and readers that he had sought in various libraries throughout the world. All of them echoed what the foreign god held high; “one”, “1”, “unity”, “alpha”, “n/n”, each one saying it aloud or holding the abstract symbols in their hands. The dream continued on; Gunf could not wake himself from it. Scholars were replaced by other scholars, readers by other readers. Gunf awoke to the clanging bell attached to a camel being led in the alleyway beside his window. He was sweaty and damp from the fear of the dream. Still in his night cloths, he ran to his table and made several notes; some in mathematical terms, some in geometrical figures and a few repeats from various religious sources. One (“1”) became the meaning of Gunf’s life. The remainder of his work centered around the number 1 (one). … …. ….. …… Yet, other things had not yet played out. His children “came of age.” At that point they became a factor in the world (along with all the rights and responsibilities of factoring). They also earned a title and the appropriate suffix, !, which denoted adulthood. The young man named “0” became “0!” (zero factorial) and the young woman named “1” became “1!” (one factorial). It was only then that Gunf realized that his two children had both become identical to the mathematical number 1; which was also ‘unity’ which was also ‘God.’ Furthermore they were identical and he could no longer tell them apart or even know which one was originally “0” and which one was “1” . The history of Gunf trails off at that point due to the deteriorating condition of the manuscript; although there must have been more to this biography. This entry was posted in Another Short Story by Waldo, Farcical and tagged Cardan, DeLudo Al, DeLudo Aleae, Descartes, factorial, Galicia, Galileo, Huygens, John Graunt, Leibnitz, manuscript, Newton, tables, Tarnapol, Tripsek Gunf, Ukraine, University of Texas. Bookmark the permalink.